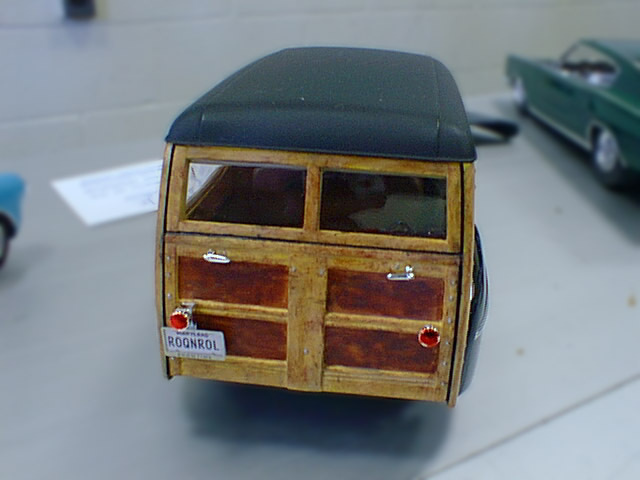 This is Irvin's first woody project, so when it came time to paint the wood, he studied under the master. Irving got himself tutored in painting plastic to look like wood from club president Lyle Willits. According to Lyle, Irvin watched him for about five minutes, said, "okay", then went home and painted this masterpiece. The rest of the body is coated with Tamiya Dark Metallic Blue straight from the spray can. Of course before painting started, Irvin cleaned up the back end of the car by eliminating the rear-mounted spare tire. The car currently displays Irvin's signature license plate, but as soon as he decides on one that cleaverly plays on the woody theme, he'll be changing it.